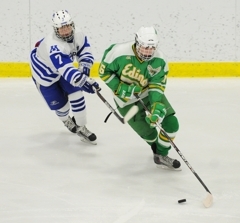 Louie Nanne had his doubts about the latest round of Edina coach Curt Giles’ lineup shuffling. It’s one thing to have your kid brother moved from defense to forward, it’s altogether something else to have him playing on your line. If Louie, a junior who has committed to play at the University of Minnesota, needed convincing that Tyler, a sophomore who had been a defenseman all season, was a worthy linemate, it didn’t take long to for him to see this new alignment might not be so bad after all. Tyler’s gruntwork behind the goal and on-the-tape pass to Louie was a snapshot of a game filled with instant chemistry between the duo. Their play helped the No. 5-ranked Hornets beat No. 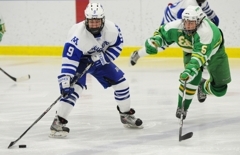 2 Minnetonka 3-2 in the Thursday, Jan. 19, Lake Conference matchup at the Pagel Activity Center in Minnetonka. 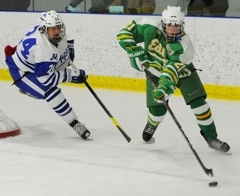 The Hornets (14-3-0) were in desperate need of a scoring line other than the irrepressible trio of freshman Dylan Malmquist, sophomore Connor Hurley and junior Andy Jordahl. 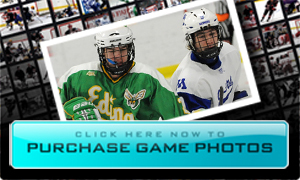 Malmquist, with a team-best 14 goals, and Hurley, with 13 goals, have accounted for almost half of Edina’s scoring. “We’re just trying to put things in place for us that make sense and give us a chance,” Giles said. The Nannes were at least as effective as the Malmquist-Hurley combination. Not bad, considering they had practiced together for just three days. 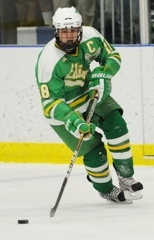 Tyler Nanne was a forward through Bantams, so it’s not like he is a newbie at the position. In fact, his biggest adjustment was the shift back to defense to start the season. Now that experiment is on hold while another one is underway. Edina junior goaltender Willie Benjamin has allowed more than three goals just twice this season in 14 full games. 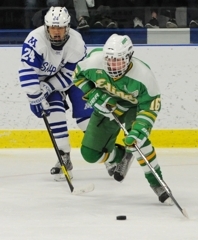 He gave up an unsightly barrage of goals in a 6-0 loss to Minnetonka on Dec. 27 in the semifinals of the Schwan Cup Gold Division at the Xcel Energy Center in St. Paul. 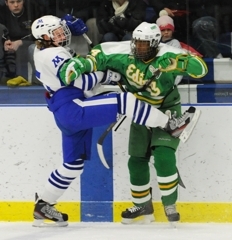 “Willie is an interesting guy,” Edina coach Curt Giles said. “The 6-0 game really didn’t bother him much. He knows that it obviously wasn’t one of his best outings, or our best outings, but he just comes to work every day and works hard. Benjamin made 37 saves, several of them in spectacular fashion, in the rematch with the Skippers on Thursday night. This time just two pucks got past him. “We had a chip on our shoulder coming out here tonight,” Benjamin said. “We wanted to beat them bad. 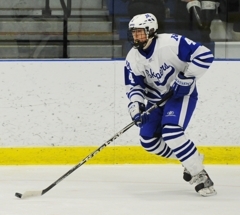 Minnetonka had a 39-24 advantage in shots, and Benjamin did a good job keeping the second chances to a minimum. 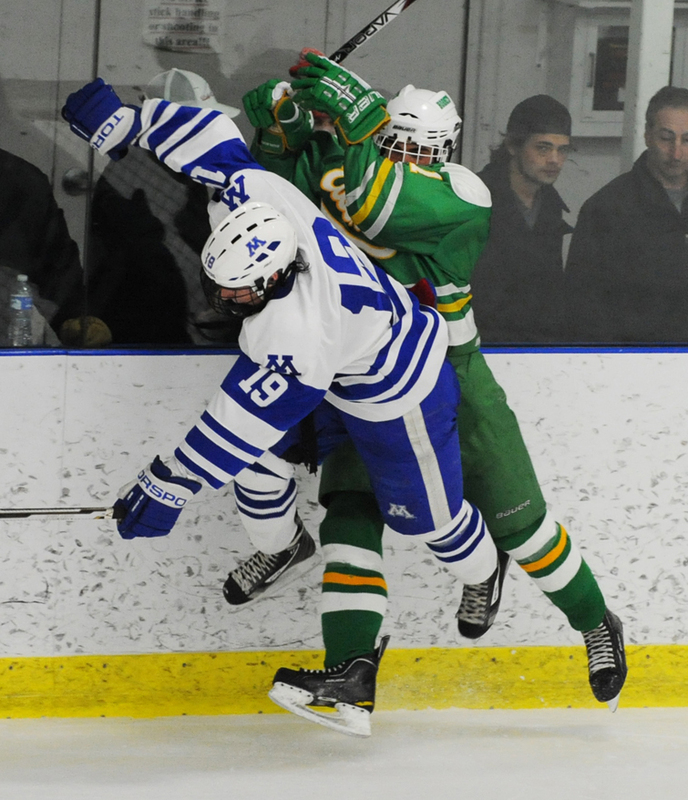 Minnetonka’s Pagel Activity Center mystique took another hit at the hands of Edina, as the Hornets’ 3-2 victory on Thursday was just the second home loss in more than three seasons for the Skippers. That last team to beat Minnetonka at home? 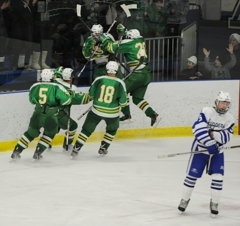 Edina, which accomplished the feat last year in a 4-2 triumph on Feb. 10. Minnetonka, ranked No. 2, had defeated the Hornets 6-0 earlier in the season. 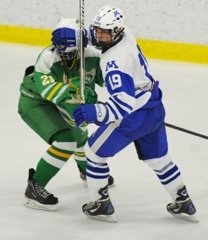 “You beat someone 6-0, and they are going to come back with some pride,” Minnetonka coach Brian Urick said. “They came back and took it to us tonight, and our guys weren’t ready to go. The Skippers face another big test on their home ice on Saturday when they host No. 1 Duluth East as part of Hockey Day Minnesota. Could the Skippers have been caught looking ahead to the Greyhounds? Junior forward Andy Jordahl scored with 1 minute, 20 seconds remaining to boost No. 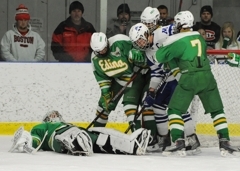 5-ranked Edina past No. 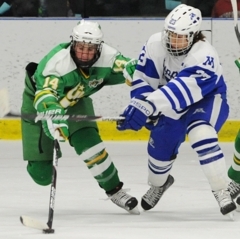 2 Minnetonka 3-2 in front of a near-capacity Pagel Activity Center crowd on Thursday, Jan. 19. 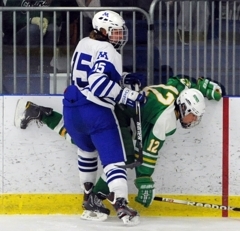 Jordahl scored after a Hornets’ pass through the slot deflected off a Minnetonka player’s skate. The puck landed on Jordahl’s stick, and he promptly deposited it into an open net. 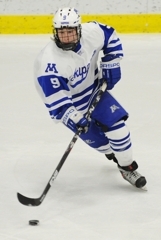 The loss was just the second of the season for Minnetonka (15-2-0), which had defeated Edina 6-0 in the semifinals of the Schwan Cup Gold Division on Dec. 27. 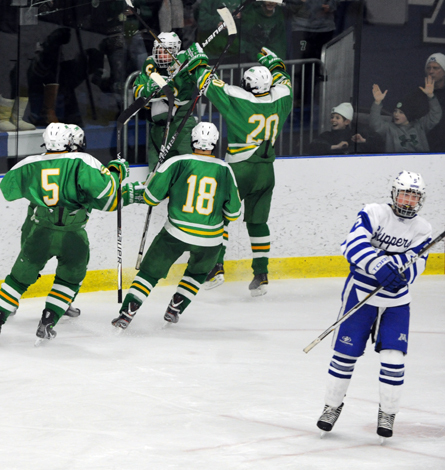 Edina (14-3-0) is the only team to beat the Skippers on their home ice in the past two seasons, accomplishing the feat two years in a row. After a scoreless first period, each team scored twice in the second. 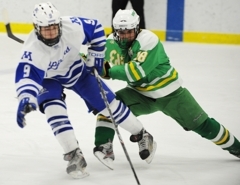 Minnetonka senior Sam Rothstein opened the scoring, and Edina roared back to take a 2-1 lead on goals by Dylan Malmquist and Louie Nanne. 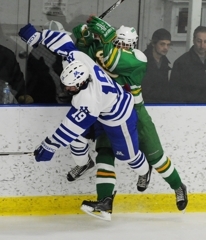 Junior Charlie Huminski scored his first varsity goal with 30.6 seconds left in the second period to allow the Skippers to pull into a 2-2 tie heading into the third. 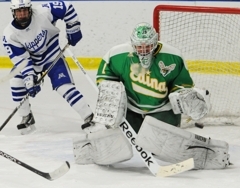 Edina goaltender Willie Benjamin made 41 saves en route to the victory. 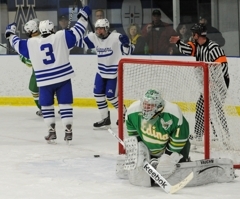 Minnetonka goaltender Paul Ciaccio finished with 26 saves. The freshman sensation added another "gamebreaker" entry to his fast-growing resume by scoring a goal and assisting on linemate Andy Jordahl’s game winner. 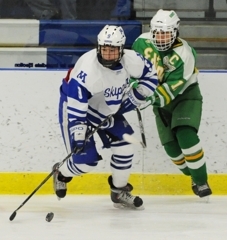 Malmquist showcased his speed on his goal, using a burst to get around Minnetonka defenseman Tommy Vannelli. Malmquist is the Hornets’ top goal scorer with 14 and ranks second in points with 23. 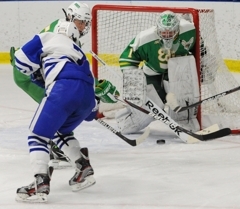 The junior goaltender was rock solid, especially in the late stages of the third period, when Minnetonka buzzed the net and had several scoring chances. Benjamin, who had allowed six goals in a loss to the Skippers earlier in the season, finished with 37 saves. The senior forward assisted on both Skippers’ goals, and he just missed scoring a goal or two himself as he had several close-range opportunities. On at least two occasions he helped set up plays by diving to reach loose pucks, and he was again a force in the corners and along the boards.